What are the most popular online bachelor's degrees offered in Arizona? Through the Western Interstate Commission for Higher Education (WICHE), Arizona has been involved in several initiatives to promote online learning for students. As a result, many online colleges in Arizona are highly accessible and greatly developed. Arizona participates in the State Authorization Reciprocity Agreement (SARA) to increase student access to online education across state lines, as well as the WICHE Cooperative for Educational Technologies (WCET). WCET advocates for more integration of technology into higher education. Despite the state's demonstrated commitment to online education resources, tuition rates have increased by 8.3% from 2010 to 2015 across four year public institutions in Arizona. The state's appropriation budget for higher education has shrunk substantially, contributing to the problem of increased prices for post-secondary institutions. According to the Center on Budget and Policy Priorities , Arizona has decreased state funding and increased tuition more than any other state since the 2008 recession. The increase in tuition can be viewed as a deterrent from students investing in higher education. However, those who do commit to online learning programs through colleges in Arizona are provided a strong framework to complete their degrees due to the state's active integration of online education tools into higher education. Arizona's demonstrated commitment to making distance learning more accessible and technologically innovative makes online college a worthwhile investment for many. Topping the list of all universities in the nation for the number of Fulbright awards given to students during the previous academic year, it’s safe to say that ASU is deserving of its place among the best online colleges in Arizona. Physical campuses and online learning classrooms comprise nearly 100,000 students taking advantage of hundreds of degree programs at every level, with 63 online undergraduate programs available for distance learners. These offerings range from traditional subjects like accounting, education, and business to more unique programs such as urban planning, public service and public policy, and integrative health. Online courses are designed and taught by the same leading faculty teaching on campus, meaning online students have the opportunity to learn from Nobel laureates, Pulitzer Prize Winners, and Fulbright scholars -- all while never leaving the comfort of their homes. Online students receive personalized support from enrollment counselors, academic advisors, and success coaches, and distance students can connect and network through the school’s online clubs and organizations. Situated in the mountain town of Flagstaff near the Grand Canyon, NAU is one of the many Arizona online colleges dedicated to providing thoughtful, modern, and rigorous degree programs to students in every corner of the country. Using Blackboard Learn, enrolled students are currently completing online bachelor’s degrees in 45 different areas of study. Many of these degrees -- such as business administration -- also offer a range of emphases for students looking to hone in on entrepreneurship, supply chain management, global business, or marketing. NAU also offers industrious learners a personalized education plan known as the self-paced option. This program is competency-based, allowing students to work towards their degrees more quickly if they have the time and energy to do so. Students who choose this university can rest assured knowing they’re following in the footsteps of thousands of past learners who have found success thanks to the skills and knowledge gained from their NAU educations. Founded on a deep commitment to providing a Christian community of grace, the Phoenix campus of Ottawa University is considered to be one of the best online colleges in Arizona due to not only its values, but also its academic rigor. The university formed in 1865 out of a desire to serve the Ottawa Indian tribe; today the institution offers learning options to more than 5,000 students attending on campus and online. A total of 26 online bachelor’s degrees are currently available, with standout programs including addiction counseling, data science and technology, management of information systems, and studies in Christian ministries. The online learning program was created with the belief that it’s important to provide flexible, balanced programs that make it possible for working professionals and those with family responsibilities to complete their educations without added stress. To that end, the school also works diligently to ensure tuition rates are kept low and student aid opportunities are plentiful. Embry-Riddle Aeronautical University is well known among Arizona colleges for its innovative bachelor’s degree offerings. As one of the first online colleges in Arizona -- first delivering distance learning programs in 1971 -- the school continues to respond to the ever-evolving needs of the most in-demand industries. A total of 15 online bachelor’s programs are currently available in areas ranging from aeronautics and aviation security to safety management and unmanned systems applications. With a critical understanding of the busy lives of many students, ERAU offers 12 different undergraduate start times per academic year, with each session lasting nine weeks. Faculty and administrators also work with students to create a personalized degree map to ensure all learners are able to graduate on time, regardless of outside obligations or where they are located. Notably, the school offers an aviation-focused Massive Open Online Course (MOOC) -- which is free and accessible to anyone with an internet connection. The course provides a great introduction to online learning for prospective students at Embry-Riddle. Established in 1885 as a land-grant university, UA was the first university in the middle of the Sonoran Desert. Today, students enjoy the benefits of world-class faculty, billions of dollars in research funding annually, and academics focused on equipping students with the skills and knowledge they need to be transformative leaders in a 21st century workforce. Diversity is a central focus at the school, with a range of academic programs, support services, student clubs, blog posts, and resources to ensure students develop into culturally competent graduates who champion diversity in all forms. In total, 29 bachelor’s degrees are currently available in a fully online format, with innovative programs ranging from Africana studies and cyber operations to geographic information systems and study of the American experience. Unique to the school is its online bachelor of science (BS) degree in sustainable built environments with an emphasis in sustainable buildings -- making UA one of the best online colleges in Arizona for students focusing their studies on sustainability. If you want to qualify for a range of high-paying job opportunities, earning a college degree is key. When deciding where and what you want to study, you may end up weighing both in-state and out-of-state schools. If you are from Arizona, there are many advantages to attending college in your home state. Sticking close to home can qualify you for in-state tuition and help you build a network of regional professional contacts. You may also benefit from your school's name recognition on the local job market, and you'll be relatively close by if you need to occasionally visit campus. When researching programs, be sure to consider our list of the most affordable online colleges in Arizona. All of the schools in this list are accredited, and our rankings highlight the colleges that offer the best blend of affordable tuition and return on investment. In addition to being one of the largest universities in the country, Arizona State University maintains one of the nation’s largest distance learning departments. The school offers over 140 undergraduate, graduate, and certificate online programs. Most coursework at ASU is asynchronous. Some programs require an on-campus component so online students and interact face-to-face with professors and peers. All of ASU’s online students may pay in-state tuition, making the school one of the most affordable online colleges in Arizona. Transfer students who have earned 24 or more college credits with a minimum GPA of 2.5 are preferred. Freshman applicants must have a 3.0 GPA, score in the top 25% of their class, or earn an ACT score of 24 (22 for AZ residents) to be considered for admission. The University of Arizona maintains an extensive online presence, offering over 90 undergraduate, graduate, and certificate programs online. Though most coursework is asynchronous, a small percentage of programs do require synchronous class meetings. Students in UA’s online programs are expected to engage with other students through discussion boards 3-5 days a week. Thanks to its wide variety of financial aid and scholarship options, UA Online is one of the most affordable online colleges in Arizona. Before applying, all potential students should verify that UA’s programs are available in their state and check the transfer credit guide to see which of their courses will transfer. Specializing in aerospace and aviation, Embry-Riddle Aeronautical University maintains physical campuses in Prescott, Arizona and Daytona Beach, Florida. The school’s worldwide campus offers 44 undergraduate, graduate, and certificate programs online, most of which are in the fields of aviation, aerospace, business, engineering, and technology. Embry-Riddle has designed its programs to fit into any lifestyle; the school makes it possible for students to choose between synchronous and asynchronous programs. Embry-Riddle does not have many admission requirements except for transcripts and a preferred minimum GPA of 2.5. However, applicants should be aware that Embry-Riddle is one of the most well-regarded colleges in Arizona, so admission is competitive. The school accepts transfer credits on a case by case basis. Embry-Riddle allows all online students to pay in-state tuition, making it one of the more affordable online colleges in Arizona for out-of-state students. Located near the San Francisco Peaks in Flagstaff, Northern Arizona University offers online bachelor’s degrees, master’s degrees, and certificates in many fields, including business, technology, engineering, and modern languages. Most NAU programs deliver coursework asynchronously through Blackboard. Students learn course material through discussion boards and downloadable lecture presentations. NAU also offers Personalized Learning online programs, which are completely self-paced. Though out-of-state online students are not able to pay in-state tuition, NAU’s financial aid office is working towards making the school one of the most affordable online colleges in Arizona by helping students earn federal loans, grants, and scholarships. Ottawa University - Phoenix’s mission is the promotion of adult education. The school offers a total of 30 online undergraduate and graduate programs. All online programs fall under one of three categories: business, education, or arts and sciences. Coursework in each program is asynchronous and delivered through Blackboard. Typically, classes last eight weeks. To be considered for admission, applicants should submit all of their previous transcripts. Graduate students must submit three letters of recommendation. As one of the most affordable online colleges in Arizona, Ottawa allows all online students -- both in-state and out-of-state -- to pay the same low per-credit tuition rate. In 2013, one out of every eight students enrolled at US postsecondary institutions were registered in exclusively online courses, with one in four college students taking at least one online course. The enrollment numbers are growing in Tempe, with ASU seeing a recent 34% spike in online course registrations. Due to Arizona's long history with and familiarity with distance education, this growth is poised to continue. 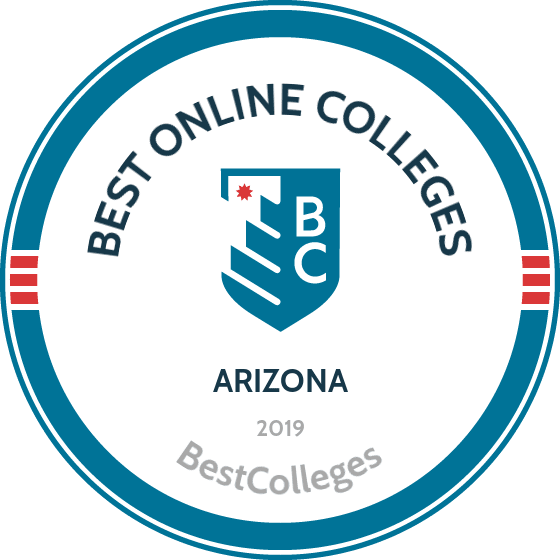 Browse our list of the best online colleges in Arizona for more insight into distance learning programs in this state. According to a recent NCES report , in fall 2012, 48.2% of students enrolled in Title IV institutions in Arizona (360,835 students) were in exclusively online programs. Distance learning has become an increasingly popular form of obtaining a higher education, and the state of Arizona has helped lead the charge. Due to Arizona's strong emphasis on high quality distance learning, in 2013 colleges in Arizona counted 360,835 students registered exclusively in the programs, a majority of whom live out of state. Now that online classes are present in the course catalogues of more and more higher education institutions, an online degree has never been more attainable. Employment growth in this profession is moderate in Arizona. According to the Office of Economic Opportunity, long term projections show an increase of 14% in the total number of jobs between 2014 and 2024. Wages remained relatively stable from 2011-2016. In Arizona, what were the top careers in 2016 for people who had a degree in psychology? Data source: Office of Economic Opportunity, Bureau of Labor Statistics. Data may not be available for every year. Employment growth in this profession is strong in Arizona. According to the Office of Economic Opportunity, long term projections show an increase of 30% in the total number of jobs between 2014 and 2024. Wages decreased by 6% from 2011-2016. What were the top careers in Arizona in 2016 for people who had a degree in business administration and management? Employment growth in this profession is strong in Arizona. According to the Office of Economic Opportunity, long term projections show an increase of 98% in the total number of jobs between 2014 and 2024. Wages increased by 3% from 2011-2016. In Arizona, what were the top careers in 2016 for people who had a degree in registered nursing? In Arizona, employment growth in this profession is moderate. According to the Office of Economic Opportunity, long term projections show an increase of 14% in the total number of jobs between 2014 and 2024. Wages increased by 12% from 2011-2016. What were the top careers in Arizona in 2016 for people who had a degree in history? Employment growth in this profession is strong in Arizona. According to the Office of Economic Opportunity, long term projections show an increase of 39% in the total number of jobs between 2014 and 2024. Wages decreased by 1% from 2011-2016. In Arizona, what were the top careers in 2016 for people who had a degree in speech communication and rhetoric?